A couple of years ago GBIF started including images for occurrence records in their biodiversity portal. Last week I was able to add images from our digital repository into our GBIF data feed so that RBGE can now contribute to this global resource. Currently this is around 360,000 images linked to herbarium specimens (mainly scans of specimens) and 44,000 images linked to living collection accessions. This amounts to a great deal of work from all staff at RBGE over many years (including the incredibly patient Rob Cubey) becoming visible in a new form. 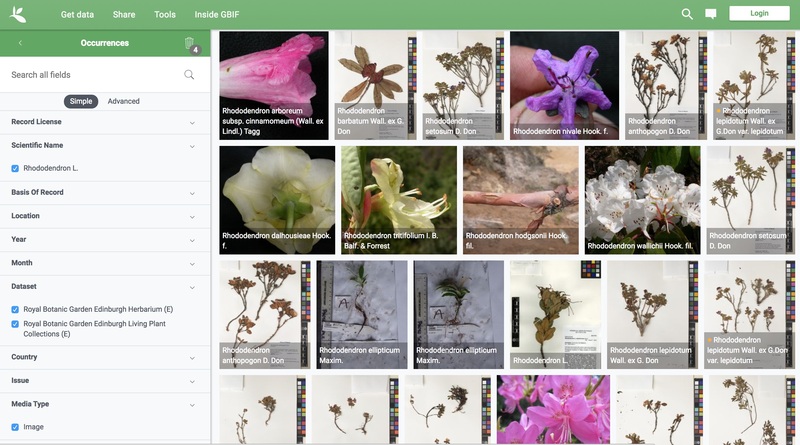 Going forward new scans in the herbarium and images linked to accessions in the digital repository will automatically appear in the GBIF portal. These things are never totally straight forward and you may notice that some images take a while to appear the first time they are viewed. This will be come much quicker as GBIF cache smaller versions of the images. Click the image above to see and example of GBIF gallery.